At Hooked on Cycling, we have developed over 150 different cycling holidays, with interesting itineraries all over Europe which you can choose from. These range from easy trips, ideal for beginners to more challenging tours. We specialise mainly in self-guided bike tours, which means that we give you all the information and assistance you need, without any unnecessary interference. Whether you would like to explore the bucolic wine trails of Provence or the beautiful cities of Italy, we have the perfect cycling holidays for you. To help you decide you can view our comprehensive tour selector. 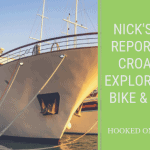 You might wish to join one of our guided bike and boat trips in Croatia, Greece, Turkey or Scotland or you may wish to take a family holiday with active teenagers. With a younger family, why not review our trips specially designed for cycling families with children under 12. If you are looking for a challenge, we can provide you with an itinerary that really tests your fitness levels, in this case, our road bike holidays would be ideal or even take part in a European Gran Fondo Sportive. As keen cyclists ourselves, we are aware that people who are new to the hobby have different needs to those with more experience and greater fitness. With this in mind, we have created a wide variety of European cycling holidays covering all fitness levels and abilities. This is to ensure that we can cater to the needs of cyclists both old and new, and every stage in between. The greatest appeal for many with cycle touring is the chance they offer to spend time getting to know a different culture, a different way of life. Whether you follow our self-guided cycling itineraries in France, Italy, Germany, Spain, Greece, or elsewhere in Europe, you can have plenty of time to immerse yourself in the local culture. Exploring foreign cuisines is great fun. We make sure that the stopping points on our tours include some of the best spots in Europe for great-tasting food. If you are cycling in the afternoon, a light lunch is recommended but there is nothing to stop you indulging your passion for fine food to the full in the evenings. Our tours feature many places of historic interest, in both rural and urban settings. Getting to know a different culture is much easier when you have a sense of history in which to base your impressions of the different lifestyles and traditions you encounter on your journeys. One of the biggest attractions of our cycling holidays, at least as far as we can tell from the feedback we have received over the years; is the scenic routes that we have chosen. From expansive views over verdant countryside to stunning cityscapes that evoke the rich history of Europe. If you opt for one of our sporting cycle tours by road bike, you will have the chance to tackle some challenging terrain. We know exactly what it is like to be disappointed by the easy routes that some so-called advanced cycle tours offer. We can promise you that this will never be an issue when booking one of our sporting cycle breaks in Europe. If you have any questions about our European tours, please feel free to get in touch and we will be happy to provide you with all the information you need. If you are ready to make a booking, you can either do so online or over the phone.